We previously developed a test for detecting naturally occurring protein-induced skin sensitization based on the markers and criteria of the human cell-line activation test (h-CLAT) and showed that the h-CLAT was useful for assessing the allergenic potency of proteins. However, test proteins were contaminated with varying amounts of lipopolysaccharide (LPS), which might have contributed to the stimulation of CD86 and CD54 expression. In this study, we developed a method to exclude the effects of LPS in the assessment of skin sensitization by naturally occurring proteins. We tested two inhibitors [the caspase-1 inhibitor acetyl-Tyr-Val-Ala-Asp-chloromethylketone (Ac-YVAD-cmk; hereafter referred to as YVAD), which can mitigate the LPS-induced increases in CD54 expression, and polymyxin B (PMB), which suppresses the effect of LPS by binding to its lipid moiety (i.e., the toxic component of LPS)]. After a 24 hr exposure, YVAD and PMB reduced LPS-induced CD86 and CD54 expression. In particular, the effect of PMB was dependent upon pre-incubation time and temperature, with the most potent effect observed following pre-incubation at 37°C for 24 hr. Moreover, only pre-incubation with cell-culture medium (CCM) at 37°C for 24 hr showed an inhibitory effect similar to that of PMB, with this result possibly caused by components of CCM binding to LPS. Similar effects were observed in the presence of ovalbumin (with 1070 EU/mg LPS) and ovomucoid, and lysozyme (with 2.82 and 0.234 EU/mg LPS, respectively) in CCM. These results indicated that PMB and CCM effectively eliminated the effects of LPS during assessment of protein allergenicity, thereby allowing a more accurate evaluation of the potential of proteins to induce skin sensitization. We previously used the human cell-line activation test (h-CLAT) (Ashikaga et al., 2006; Sakaguchi et al., 2006, 2009), an in vitro skin-sensitization test, to assess the allergenic potential of proteins by measuring levels of CD86 and CD54 in THP-1 human monocytic leukemia cells, finding that five proteins could be evaluated positively using the h-CLAT. Additionally, we showed that false-positive results for human serum albumin (HSA) might be caused by lipopolysaccharide (LPS), varying amounts of which might have contaminated the naturally occurring proteins and contributed to the stimulation of CD86 and CD54 expression (Tsukumo et al., 2018). Moreover, we demonstrated that when the test proteins contained ≥ 0.1 EU/mL LPS, their allergenic potency could not be accurately assessed using this method. LPS is a cell-wall component in gram-negative bacteria that comprises lipid and polysaccharide moieties (Raetz and Whitfield, 2002). LPS is ubiquitous and detected at varying concentrations in water and air, with even small amounts (from picogram to nanogram levels) showing activity (Rylander, 2002). Moreover, LPS persists even in heat-inactivated bacteria, making it difficult to eliminate (Tanamoto, 2008). As a result, naturally occurring proteins are often contaminated with LPS. There are no reports on the allergenic potency of LPS. However, it is known that LPS can activate an innate immune response by promoting the production of cytokines, e.g., IL-1, IL-6, and TNF-α, in monocytes or macrophages and LPS plays a role as an adjuvant of antibody formation in protein allergy (Berin and Shreffler, 2008; Guha and Mackman, 2001; Schenck et al., 1969; Talcott et al., 1975). Therefore, it is important to consider the influence of LPS on in vitro assays, including the h-CLAT, that use the immune responses of cultured cell lines as endpoints. When LPS is contaminated in the test protein, it is necessary to consider both the result of contamination of LPS and the result of excluding the influence of LPS, and to carry out risk assessment. Many methods for suppressing LPS activation have been reported, with most involving the use of LPS inhibitors, such as polymyxin B (PMB) and an anti-Toll-like receptor (TLR)-4 antibody (Cardoso et al., 2007; Cooperstock and Riegle, 1981; Daubeuf et al., 2007; Shimazu et al., 1999; Song and Phelps, 2000). An anti-TLR-4 antibody would not be an appropriate LPS inhibitor in our study, given that it regulates skin-sensitization pathways (Ainscough et al., 2013; Honda et al., 2013). Additionally, although adsorption-based removal of LPS by affinity chromatography has also been reported (Magalhães et al., 2007; Petsch and Anspach, 2000), the protein recovery rate and cytotoxicity of the eluate are important considerations. Moreover, using this labor-intensive method, it would be difficult to reduce LPS to levels below the limit of detection of the h-CLAT (0.1 EU/mL) due to the limited adsorption capacity of the molecule (Liu et al., 1997; Reichelt et al., 2006; Talmadge and Siebert, 1989). Removal by two-phase detergent-based extraction is more effective (Teodorowicz et al., 2017); however, the cytotoxicity of the eluate and its effect on cellular immune responses (e.g., CD86 and CD54 expression in THP-1 cells) need to be examined, and its operational complexity has hindered its widespread use. A previous study reported that LPS treatment resulted in elevated CD54 expression (Tsukumo et al., 2018). Additionally, another study indicated that CD54 expression is the result of interleukin (IL)-1β-activated nuclear factor-κB signaling through the IL-1 receptor (Chen et al., 2000; Lin et al., 2005). Moreover, IL-1β is formed following activation of caspase-1 (an enzyme responsible for IL-1 conversion) via formation of the nucleotide oligomerization-domain-like receptor family pyrin-domain-containing protein (NLRP)3 inflammasome (Cassel et al., 2009). Furthermore, THP-1 cells reportedly express components of the NLRP-3 inflammasome, exhibit caspase-1 activation, and display IL-1β formation (Chanput et al., 2014; Watanabe et al., 2007). Acetyl-Tyr-Val-Ala-Asp-chloromethylketone (Ac-YVAD-cmk; hereafter referred to as YVAD) was reported to be useful for inhibition of the formation of IL-1β (Schumann et al., 1998; Donnelly-Roberts et al., 2004). YVAD, a synthetic peptide, inhibits caspase-1 activation by binding to its active site, with this inhibitory activity previously reported in THP-1 cells (Schumann et al., 1998). Therefore, in the present study, we used YVAD to inhibit LPS-induced CD54 expression. PMB is an antibiotic synthesized from naturally occurring peptides produced by Bacillus polymyxa, a soil bacterium, and that inhibits LPS by binding to its lipid moiety, which represents the toxic component of LPS (Morrison and Jacobs, 1976). Additionally, PMB suppresses the production of cytokines, including IL-1β, IL-8, and tumor necrosis factor (TNF)-α, in THP-1 cells (Cardoso et al., 2007; Song and Phelps, 2000). In our previous study, we used PMB at 1 μg/mL, a concentration that is non-toxic to cells and does not affect CD86 or CD54 expression, in order to eliminate any effects on the h-CLAT, finding that levels of both proteins were downregulated in THP-1 cells to below the h-CLAT cut-off value at LPS concentrations of 0.1 (CD86) and 0.01 (CD54) EU/mL, respectively (Tsukumo et al., 2018). These data indicate that treatment with 1 μg/mL PMB for 30 min cannot completely inhibit CD86 and CD54 expression induced by 0.2 EU/mg to 4000 EU/mg LPS in the test proteins. In the present study, we investigated the influence of LPS exposure time on CD86 and CD54 expression and determined the optimal test conditions using inhibitors that eliminated the effect of LPS during the assessment of skin sensitization potential of naturally occurring proteins. We used the inhibitor YVAD to eliminate LPS-specific effects. Additionally, we used PMB to evaluate test conditions, including pre-incubation time and temperature, and investigated the effect of solvent along with LPS pre-incubation. Furthermore, we assessed three allergens [i.e., ovalbumin (OVA, containing 1070 EU/mg LPS), ovomucoid (OVM; containing 2.82 EU/mg LPS), and lysozyme (LYZ; containing 0.234 EU/mg LPS) for their ability to further inhibit LPS-related effects under the same test conditions that displayed LPS inhibition. Albumin from hen egg white (OVA; ≥ 98% purity), trypsin inhibitor from chicken egg white type III-O (OVM), LYZ from chicken egg white (≥ 98% purity), LPS from Escherichia coli O111:B4, YVAD (≥ 95% purity), and PMB sulfate salt were purchased from Sigma-Aldrich (St. Louis, MO, USA). Dimethyl sulfoxide (DMSO) was obtained from FUJIFILM Wako Pure Chemical Corporation (Osaka, Japan). Saline and sterile water for injection (WFI) were obtained from Otsuka Pharmaceutical Co. (Tokyo, Japan). The THP-1 human monocytic leukemia cell line was purchased from the American Type Culture Collection (Manassas, VA, USA) and cultured in Roswell Park Memorial Institute-1640 medium with 10% (v/v) heat-inactivated fetal bovine serum (FBS), 0.05 mM 2-mercaptoethanol, and 1% (v/v) penicillin-streptomycin solution (all from Thermo Fisher Scientific, Waltham, MA, USA) at 37°C and 5% CO2. The cells were routinely sub-cultured every 2 to 3 days at a density ranging from 0.1 × 106 cells/mL to 0.2 × 106 cells/mL. Prior to the h-CLAT assay, cells were seeded at 0.1-0.2 × 106 cells/mL and cultured for 48 hr to 72 hr. The density of the cells was maintained < 0.5 × 106 cells/mL, and the passage number was < 30. Protein solutions were prepared at a concentration of 1% (w/v) in culture medium. LPS (600,000 EU/mg) was dissolved in culture medium (1 mg/mL) and diluted to 0.01 EU/mg to 10 EU/mL with culture medium or saline. YVAD was dissolved in DMSO to obtain a concentration of 100 mM. The YVAD/DMSO solution was then diluted 250-fold with culture medium (400 μM). PMB was dissolved in sterile WFI to obtain a concentration of 1 mg/mL, followed by dilution with culture medium to a final concentration of 4 μg/mL. Medium with DMSO only (250-fold dilution with 0.2% DMSO) was prepared as a solvent control for YVAD, and medium without proteins was prepared as a solvent control for proteins and PMB. Medium without proteins or with saline only (2-fold dilution with 50% saline) was prepared as a solvent control for LPS. A 500-μL volume of each sample was added to 24-well plates, and THP-1 cells were resuspended in fresh culture medium at a density of 2 × 106 cells/mL, followed by the addition of 500 μL of cell suspension to each well along with the test materials. In the case of YVAD, 500 μL of THP-1 cells (2 × 106 cells/mL) was added to 24-well plates, and 500 μL of YVAD solution was added to each well and incubated for 1 hr. A 100-μL volume of LPS (11 EU/mL) was added to each well for 6 hr, 12 hr, or 24 hr. PMB solution (4 μg/mL) was combined with LPS (0.04, 0.4, 4, or 40 EU/mL) at a ratio of 1:1. The mixed solution was pre-incubated for 24 hr or 48 hr at room temperature (approximately 26°C) or at 37°C, and 500 μL of each mixed solution containing PMB (2 μg/mL) and LPS (0.02, 0.2, 2 or 20 EU/mL) was transferred to a 24-well plate. THP-1 cells were resuspended in fresh culture medium at a density of 2 × 106 cells/mL, and 500 μL of cell suspension was added to each well. Cells were exposed to the test materials for 24 hr. CD86 and CD54 expression and cell viability were analyzed according to the h-CLAT protocol (OECD TG442E, 2018). Cells treated with test samples for 6 hr, 12 hr, 24 hr, 48 hr, or 72 hr were collected in sample tubes and washed twice with 1 mL of phosphate-buffered saline (PBS) supplemented with 0.1% (w/v) bovine serum albumin (BSA; FUJIFILM Wako Pure Chemical Corporation). The supernatant was discarded, and the remaining cells were blocked with 600 μL of blocking solution [0.01% (w/v) Globlins Cohn fractions II and III (Sigma-Aldrich)] at 4°C for 15 min, followed by division into three aliquots of 200 μL each (approximately 0.3 × 106 cells/tube) before staining with antibodies. Pre-mixed antibody solutions were prepared using either 6 μL of anti-CD86 antibody (BD Pharmingen, San Diego, CA, USA) or 3 μL of anti-CD54 antibody (Dako, Glostrup, Denmark), with 3 μL of fluorescein isothiocyanate (FITC)-labeled mouse IgG1 (Dako) added to 44 µL or 47 μL of PBS containing 0.1% BSA to a final volume of 50 μL. The entire 50-μL volume of pre-mixed antibody solution was added to each cell pellet. After gentle mixing by hand, cells were incubated at 4°C for 30 min in the dark, stained with antibodies, washed twice with 200 μL of PBS supplemented with 0.1% (w/v) BSA, and resuspended in a final volume of 400 μL. The cell suspensions were transferred to a 5-mL tube through a cell strainer. Before flow cytometric analysis, 10 μL of propidium iodide (PI) solution [25 μg/mL (FUJIFILM Wako Pure Chemical Corporation) in PBS] was added to obtain a final concentration of 0.625 μg/mL in each tube. For each concentration of test material, cell viability was recorded from the isotype control cells. Criteria for positivity were adapted from h-CLAT criteria (CD86 ≥ 150% and/or CD54 ≥ 200%). LPS concentrations were determined with the limulus amebocyte lysate assay using Pyrochrome reagent with Glucashield buffer (Seikagaku Corp., Tokyo, Japan) according to manufacturer instructions. Control standard endotoxin (CSE; Seikagaku Corp.) was dissolved in sterile WFI for injection in order to obtain final concentrations of 0.0625 EU/mL, 0.125 EU/mL, 0.25 EU/mL, 0.5 EU/mL, and 1.0 EU/mL. OVA was diluted with WFI. Pyrochrome reagent was reconstituted in the dark in 3.2 mL of Glucashield buffer, followed by incubation for at least 5 min at room temperature (approximately 26°C). A 50-μL volume of each CSE, test sample, WFI sample (as negative control), and positive product control sample was transferred to a 96-well plate, and 50 μL of Pyrochrome reagent with Glucashield buffer was added. After agitation for 1 min, samples were incubated for 30 min at 37°C, with 25 μL of 50% acetic acid added to each well to terminate the reaction, followed by determination of optical density at 405 nm (OD405) using the EnVision multilabel plate reader (PerkinElmer, Waltham, MA, USA). A standard curve was generated from the OD readings against CSE concentrations, and the mean endotoxin concentrations of test proteins (EU/mg) were calculated from three experiments. The LYZ and OVM used here were from the same lot as in our previous study (Tsukumo et al., 2018); therefore, we did not measure the LPS concentrations of those proteins but rather used the values determined in the previous report. Cell-based assays were performed in triplicate, and representative results are shown. Data represent the mean ± standard deviation. The statistical significance of differences between means was evaluated with the Student’s t test or Dunnett’s post-hoc test, with P < 0.05 considered significant. All statistical analyses were performed using Excel (Microsoft Japan Co., Ltd., Tokyo, Japan) or EZR (Kanda, 2013), which is a graphical user interface for R (The R Foundation for Statistical Computing, version 3.3.0). We compared CD86 and CD54 expression induced by 1 EU/mL LPS or 0.0001% OVA. OVA was diluted with cell-culture medium (CCM) to ensure an LPS concentration of 1 EU/mL. THP-1 cells were exposed to LPS or OVA for 6 hr, 12 hr, 24 hr, 48 hr, and 72 hr. CD86 expression induced by LPS was highest at 24 hr and decreased after 48 hr (Fig. 1A), whereas CD54 expression induced by LPS was highest at 12 hr and decreased over time (Fig. 1B). Similar trends were observed using OVA. There was no difference in the viability of cells treated with LPS versus OVA (Fig. 1C). Although the LPS concentration that was used (1 EU/mL) was the same as that in 0.0001% OVA, CD86 and CD54 expression was induced to a lesser degree by the latter from 24 hr to 48 hr and from 12 hr to 24 hr, respectively. Effect of exposure time on CD86 and CD54 expression induced by LPS or OVA. THP-1 cells were treated with 1 EU/mL LPS (solid line) or 0.0001% OVA (containing 1 EU/mL LPS; broken line) for 6, 12, 24, 48, or 72 hr. CD86 expression (A), CD54 expression (B), and cell viability (C) were quantified by flow cytometry. The mean RFI ± standard deviation of three individual experiments is shown. We used the caspase-1 inhibitor YVAD to eliminate the effect of LPS in test proteins on CD86 and CD54 expression. THP-1 cells were treated for 1 hr with YVAD at a concentration of 200 μM, which is non-toxic to cells and does not affect CD86 or CD54 expression, followed by the addition of LPS (1 EU/mL) to the cells for 6 hr, 12 hr, or 24 hr. Treatment with YVAD markedly reduced the expression of CD86 at 24 hr and of CD54 at 12 hr and 24 hr (Fig. 2A and B); however, CD54 expression remained higher than the h-CLAT cut-off value of 200% (Fig. 2B). 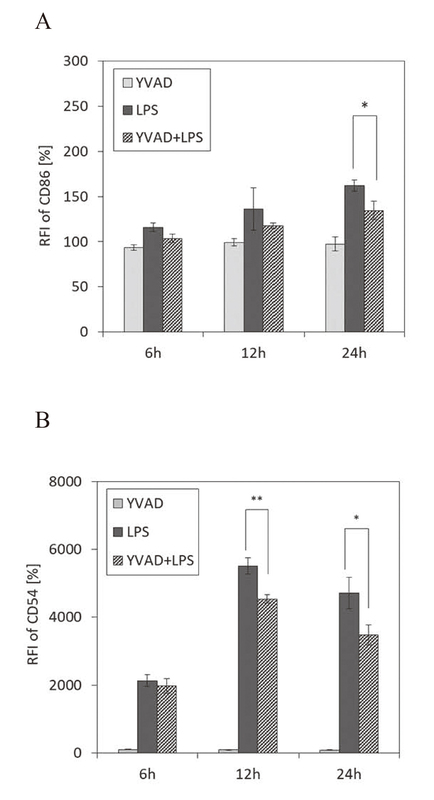 Effect of YVAD on LPS-induced CD86 and CD54 expression. THP-1 cells were pretreated for 1 hr with 200 μM YVAD, followed by exposure to LPS (final concentration: 1 EU/mL) for 6, 12, and 24 hr. CD86 (A) and CD54 (B) expression was evaluated by flow cytometry. The mean RFI ± standard deviation of three individual experiments is shown as a percentage of the control. *P < 0.05 and **P < 0.01, LPS + YVAD vs. LPS (Student’s t test). We investigated the optimal test conditions for LPS inhibition by PMB, which was reported in part in our previous study (Tsukumo et al., 2018). PMB at a concentration of 1 μg/mL, which is non-toxic to cells and does not affect CD86 or CD54 expression, was combined with LPS (final concentrations: 0.01, 0.1, and 1 EU/mL), and the mixture was pre-incubated for 24 hr or 48 hr at room temperature (approximately 26°C) before being added to THP-1 cells for 24 hr. PMB pre-incubated for 24 hr inhibited CD86 expression induced by LPS (0.1 and 1 EU/mL) to a level similar to that observed in the control (Fig. 3A). Additionally, PMB abrogated CD54 expression induced by LPS (0.01, 0.1, and 1 EU/mL) (Fig. 3B). Moreover, PMB inhibited CD86 expression induced by LPS (0.1 and 1 EU/mL) to a level similar to that in the control (Fig. 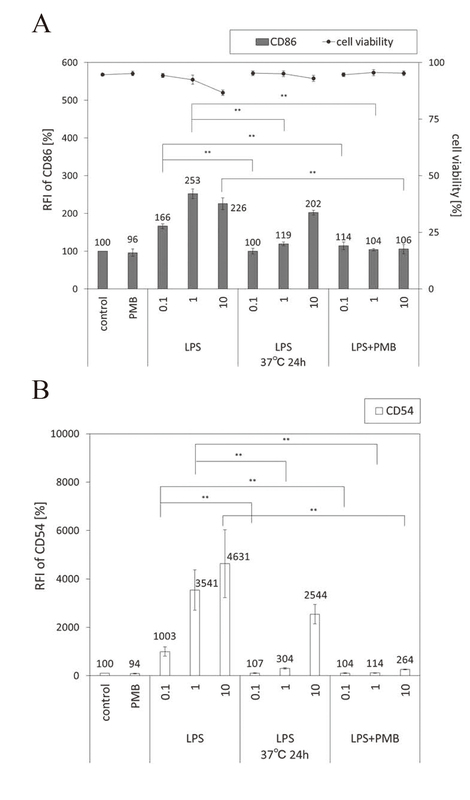 3C) and decreased CD54 expression induced by LPS (0.01, 0.1, and 1 EU/mL) (Fig. 3D) following pre-incubation at room temperature for 48 hr. Furthermore, pre-incubation without PMB at room temperature for 24 hr or 48 hr decreased LPS-induced CD86 and CD54 levels (Fig. 3A-D). The rate of inhibition of LPS-induced CD86 and CD54 expression by PMB or pre-incubation was calculated from the mean of CD86 and CD54 expression levels, and the results are shown in Table 1. The rate of inhibition of 1 EU/mL LPS-induced CD86 and CD54 expression after only 24 hr pre-incubation was 17% and 30.5%, while that after 48 hr pre-incubation was 22.1% and 42.1%, respectively. Moreover, the rate of inhibition by PMB for 24 hr was 54.6% and 92.4%, while that for 48 hr was 58.7% and 94.9%, respectively. These data indicate that the effect was dependent upon the pre-incubation time. Effect of pre-incubation time with PMB on LPS-induced CD86 and CD54 expression. PMB was diluted with CCM to 4 μg/mL, and LPS was diluted with CCM to 0.04, 0.4, or 4 EU/mL. The two solutions were then combined at a ratio of 1:1, followed by pre-incubation for 24 hr (A, B) or 48 hr (C, D) at room temperature (approximately 26°C). THP-1 cells were treated with this mixture containing PMB (final concentration: 1 μg/mL) and LPS (final concentration: 0.01, 0.1, or 1 EU/mL) for 24 hr or were treated with LPS without pre-incubation and LPS alone with pre-incubation for 24 hr or 48 hr as controls. CD86 expression and cell viability (A, C) and CD54 expression (B, D) were evaluated by flow cytometry. The mean RFI ± standard deviation of three individual experiments is shown as a percentage of the control. *P < 0.05 and **P < 0.01, vs. LPS (Dunnett’s post-hoc test). * The rate of LPS inhibition following pre-incubation with PMB under the indicated conditions was calculated from the mean CD86- and CD54-expression levels (Figs. 3 and 4). PMB (1 μg/mL) was combined with LPS (final concentrations: 0.1, 1, and 10 EU/mL), followed by pre-incubation at 37°C for 24 hr, after which the mixed solution was administered to THP-1 cells for 24 hr. We found that PMB pre-incubation at 37°C for 24 hr inhibited CD86 expression induced by LPS (10 EU/mL) to levels similar to those in the control by (Fig. 4A). Additionally, PMB reduced CD54 expression induced by LPS (1 EU/mL) to levels below the h-CLAT cut-off (Fig. 4B). Moreover, only pre-incubation at 37°C for 24 hr without PMB inhibited CD86 and CD54 expression induced by LPS (0.1 and 1 EU/mL). The rate of inhibition of 1 EU/mL LPS-induced CD86 and CD54 expression after only 24 hr pre-incubation was 17% and 30.5%, while that after 24 hr pre-incubation at 37°C was 53% and 91.4%, respectively. Moreover, the rate of inhibition by PMB for 24 hr was 54.6% and 92.4%, while that for 24 hr at 37°C was 58.9% and 96.8%, respectively. These results showed that pre-incubation-mediated and PMB-mediated inhibition was dependent upon the pre-incubation temperature (Table 1). Effect of PMB pre-incubation temperature on LPS-induced CD86 and CD54 expression. PMB was diluted with CCM to 4 μg/mL, and LPS was diluted with CCM to 0.4, 4, or 40 EU/mL. The two solutions were combined at a ratio of 1:1, followed by pre-incubation at 37°C for 24 hr. THP-1 cells were treated with this mixture containing PMB (final concentration: 1 μg/mL) and LPS (final concentration: 0.1, 1, or 10 EU/mL) for 24 hr or treated with LPS without pre-incubation and LPS alone with pre-incubation at 37°C for 24 hr as controls. CD86 expression and cell viability (A) and CD54 expression (B) were evaluated by flow cytometry. The mean RFI ± standard deviation of three individual experiments is shown as a percentage of the control. *P < 0.05 and **P < 0.01, vs. LPS (Dunnett’s post-hoc test). We then investigated the inhibitory effect of PMB on CD86 and CD54 expression induced by OVA associated with LPS. The OVA purchased for this study contained 1017 EU/mg LPS and was subsequently diluted with CCM in order to achieve LPS concentrations equivalent to 1 EU/mL (to evaluate CD54 expression) or 10 EU/mL (to evaluate CD86 expression), both of which were inhibited by PMB (Fig. 4A and B). PMB (1 μg/mL) was added to OVA, followed by pre-incubation at 37°C for 24 hr, after which the mixed solution was applied to THP-1 cells for 24 hr. Neither 0.0001% OVA (containing 1 EU/mL LPS) nor 0.001% OVA (containing 10 EU/mL LPS) increased CD86 levels above the positive cut-off value of the h-CLAT (Fig. 5A), suggesting no PMB-mediated inhibition. CD54 expression was induced by 0.001% OVA (containing 10 EU/mL LPS) to a level above the cut-off value (Fig. 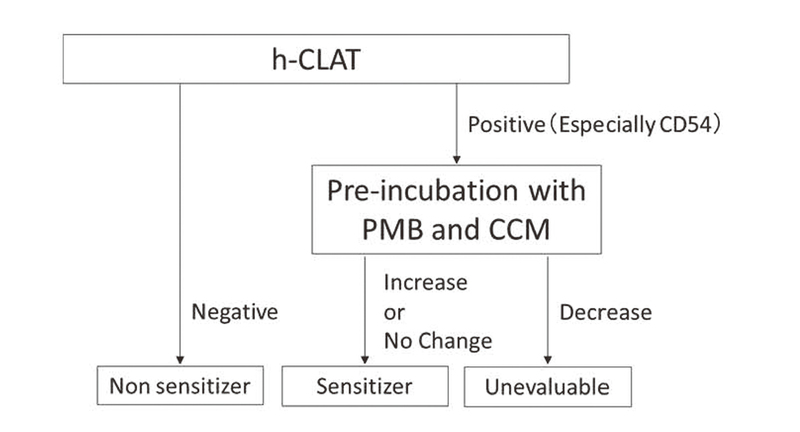 5B); however, CD54 expression was reduced by 87.9% following pre-incubation with CCM at 37°C for 24 hr, with results 200% below the h-CLAT cut-off value. Moreover, pre-incubation with CCM and PMB also inhibited CD54 expression. Effect of PMB on CD86 and CD54 expression induced by OVA including LPS. PMB at 4 μg/mL was combined with to 0.0004% OVA (containing 4 EU/mL LPS) and 0.004% OVA (containing 40 EU/mL LPS), followed by pre-incubation at 37°C for 24 hr. THP-1 cells were treated with this mixture containing PMB (final concentration: 1 μg/mL) and 0.0001% OVA (containing 1 EU/mL LPS) and 0.001% OVA (containing 10 EU/mL LPS) for 24 hr or treated with OVA without pre-incubation and OVA alone with pre-incubation at 37°C for 24 hr as controls. CD86 expression and cell viability (A) and CD54 expression (B) were evaluated by flow cytometry. The mean RFI ± standard deviation of three individual experiments is shown as a percentage of the control. *P < 0.05 and **P < 0.01, vs. OVA (Dunnett’s post-hoc test). Pre-incubation of LPS or OVA at 37°C for 24 hr with CCM as the solvent suppressed CD86 and CD54 expression (Figs. 4A and B; and 5A and B). Therefore, we investigated the effect of solvent on LPS- or OVA-induced CD86 and CD54 expression using CCM or saline as the solvent to prepare LPS (10 EU/mL), 0.001% OVA (containing 10 EU/mL LPS), and 0.1% OVA (containing 1000 EU/mL LPS). After pre-incubation at 37°C for 0 hr or 24 hr, LPS or OVA was added to THP-1 cells for 24 hr. Pre-incubation at 37°C for 24 hr with CCM but not saline decreased CD86 and CD54 expression induced by LPS (10 EU/mL) (Fig. 6A and B). Additionally, pre-incubation with CCM decreased CD86 and CD54 expression induced by 0.001% OVA (containing 10 EU/mL LPS) (Fig. 6C and D), whereas pre-incubation with saline inhibited only CD54 expression (Fig. 6D). Moreover, CCM had a greater effect on CD54 expression than saline (Fig. 6D). Pre-incubation with 0.1% OVA (containing 1000 EU/mL LPS) did not affect CD86 level but decreased that of CD54 following pre-incubation with CCM (Fig. 6E and F). Furthermore, there were no differences between CCM and saline in terms of changes in CD86 and CD54 expression induced by LPS and OVA without pre-incubation (i.e., at 0 hr) (Fig. 6A-F). Effect of solvent on OVA- or LPS-induced CD86 and CD54 expression. LPS (10 EU/mL) (A, B), 0.001% OVA (containing 10 EU/mL LPS) (C, D), and 0.1% OVA (containing 1000 EU/mL LPS) (E, F) were prepared using CCM or saline as solvents, followed by pre-incubation at 37°C for 0 hr or 24 hr. THP-1 cells were exposed to LPS or OVA for 24 hr, and CD86 (A, C, E) and CD54 (B, D, F) expression was evaluated by flow cytometry. The mean RFI ± standard deviation of three individual experiments is shown as a percentage of the control. The expression levels of CD86 and CD54 induced by LPS (A, B), 0.001% OVA (C, D), and 0.1% OVA (E, F) are shown. *P < 0.05 and **P < 0.01, 0 hr vs. 24 hr (Student’s t test). Pre-incubation with CCM at 37°C for 24 hr inhibited CD86 and CD54 expression induced by LPS (Fig. 6A and B). Therefore, we investigated whether these conditions could eliminate the effect of LPS in protein samples on allergenicity tests. We used OVA (containing 1017 EU/mg LPS), OVM (containing 2.82 EU/mg LPS), and LYZ (containing 0.234 EU/mg LPS) as the allergenic proteins and CCM as the solvent for preparing the protein solutions. Additionally, we used the same maximum concentration of 1% that was used in our previous study [i.e., 1% OVA (containing 10170 EU/mL LPS), 1% OVM (containing 28.2 EU/mL LPS), and 1% LYZ (containing 2.34 EU/mL LPS)]. After pre-incubation at 37°C for 24 hr, THP-1 cells were exposed to each protein solution for 24 hr. 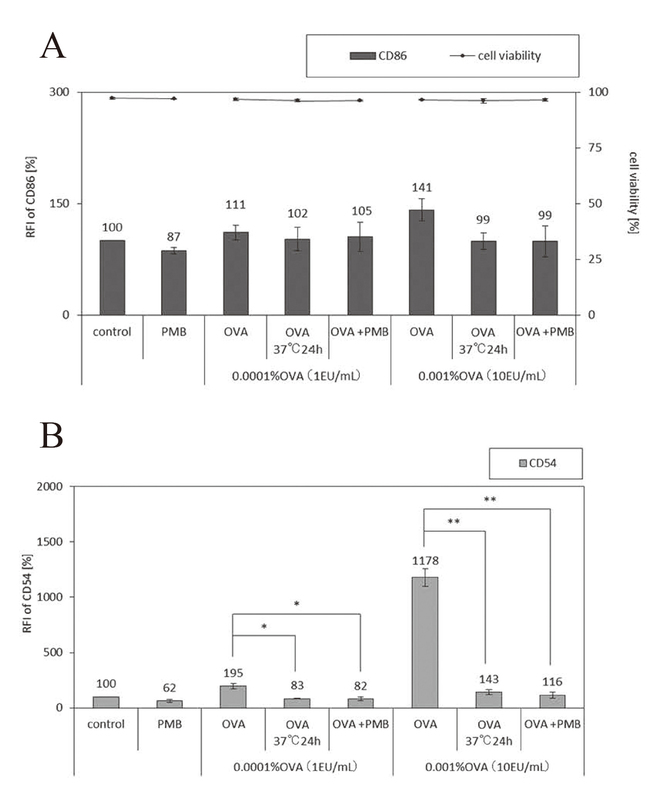 Without pre-incubation, OVM and LYZ but not OVA increased CD86 expression (Fig. 7A; 0 hr), and all three proteins increased CD54 expression beyond the cut-off level of the h-CLAT (Fig. 7B; 0 hr). Moreover, pre-incubation at 37°C for 24 hr decreased CD86 expression induced by OVM but not by OVA and LYZ (Fig. 7A; 24 hr), and CD54 expression was reduced by OVM and LYZ (Fig. 7B; 24 hr). Furthermore, we observed decreased CD54 expression in the presence of OVA (Fig. 7B; 24 hr), although the difference between 0 hr and 24 hr was not significant. Elimination of the effect of LPS by pre-incubation with CCM during the assessment of protein allergenicity. 1% OVA (containing 10170 EU/mL LPS), 1% OVM (containing 28.2 EU/mL LPS), and 1% LYZ (containing 2.34 EU/mL LPS) were prepared in CCM, followed by pre-incubation at 37°C for 0 hr or 24 hr. THP-1 cells were exposed to each allergenic protein for 24 hr. Expression of CD86 (A) and CD54 (B) was evaluated by flow cytometry. The mean RFI ± standard deviation of three individual experiments is shown as a percentage of the control. *P < 0.05, 0 hr vs. 24 hr (Student’s t test). In a previous study, we found that h-CLAT was useful for assessing the allergenic potency of proteins, but that LPS in the test proteins contributed to the induction of CD86 and CD54 expression (Tsukumo et al., 2018). In the present study, we aimed to eliminate the effect of LPS in samples of proteins assessed with the h-CLAT and investigated the effect of exposure time and test conditions using inhibitors. A previous study reported that LPS induces a change in expression of a number of inflammation-related genes (IL-1β, IL-6, IL-8, IL-10 and TNF-α) at 1-4 hr (Sharif et al., 2007; Chanput et al., 2010) and cytokine production at 6 hr (Yoshimura et al., 1997), which is a short period of time relative to the 24 hr exposure time used for the h-CLAT. Therefore, we investigated the effect of exposure time on CD86 and CD54 expression induced by 0.0001% OVA (containing 1 EU/mL LPS) and LPS (1 EU/mL) in order to eliminate the effect of LPS induced by changes in exposure time. We found that time-dependent changes in LPS-induced CD86 and CD54 expression were similar to those induced by OVA. Moreover, LPS induced the expression of both CD86 and CD54 to a greater extent than OVA. These data suggested that the activity of LPS might be reduced by the formation of a complex with OVA. This can be explained by the function of albumin, which is a soluble protein that binds and transports fatty acids or lipophilic low-molecular-weight substances (Ghuman et al., 2005; Kragh-Hansen, 1990). These results suggested that changing the exposure time might not eliminate the effect of LPS on the assessment of protein antigenicity. LPS forms the NLRP3 inflammasome in the leukocytes, macrophages (Borges et al., 2017; Liao et al., 2013; Mitachi et al., 2019). Moreover, THP-1 cells used in the h-CLAT reportedly express components of the NLRP-3 inflammasome (Watanabe et al., 2007). The NLRP3 inflammasome is a multiprotein complex that activates caspase-1, leading to the processing and secretion of the proinflammatory cytokine IL-1β (Liao et al., 2013). CD54 is upregulated by IL-1β secretion (Chen et al., 2000; Roebuck and Finnegan, 1999; Wang et al., 1995; Yang et al., 2010); therefore, we hypothesized that YVAD, a caspase-1 inhibitor, could overcome the inhibitory effect of LPS by suppressing caspase-1 activation and, consequently, CD54 expression. Our results showed that treatment with YVAD reduced CD86- and CD54-expression levels, suggesting that in addition to its previously reported effect on CD54 expression, caspase-1 activation increases CD86 expression via LPS. Additionally, CD86 levels were reduced after incubation with YVAD for 24 hr, whereas those of CD54 were reduced after 12 hr or 24 hr. CD86 is important for antigen presentation and often used as a marker of skin sensitization (Aiba, 1998; Ashikaga et al., 2002; Caux et al., 1994; McLellan et al., 1995). Moreover, CD54 is not only affected by skin sensitization but also various other stimulants, such as physical stimulation and changes in osmotic pressure (Park et al., 2000; Roebuck and Finnegan, 1999; Takami et al., 1998). Therefore, YVAD might not be the ideal inhibitor for excluding the effect of LPS, given its potential to suppress CD86 expression and function, which might be related to actual protein-specific skin sensitization. PMB blocked the action of LPS by binding to its lipid moiety, which represents the toxic component of LPS (Morrison and Jacobs, 1976). We found that the inhibitory effect of PMB was dependent upon pre-incubation time, with this result possibly associated with increased LPS adsorption by PMB according to increased pre-incubation time. Additionally, pre-incubation without PMB at room temperature for 24 hr or 48 hr decreased LPS-induced CD86 and CD54 levels. Notably, the CCM used in this study contained 10% FBS (i.e., 0.36% protein in medium), suggesting that these protein components might have bound to the lipid moiety of LPS and contributed to the observed decreases in LPS-induced CD86- and CD54-expression levels. Furthermore, investigation of the effect of pre-incubation temperature revealed that inhibition in the presence or absence of PMB was dependent upon pre-incubation temperature. This was not due to an increase in the temperature (approximately 10°C), because the activity of LPS in solution is reportedly stable at 37°C (Tsuchiya, 1990). Moreover, the amount of LPS bound to proteins can be affected by temperature (Komatsu et al., 2016). Therefore, the amount of PMB that binds LPS and, accordingly, its inhibitory effect might increase depending on the pre-incubation temperature. We evaluated CD86 and CD54 expression induced by OVA and in the presence of PMB in order to assess the inhibitory effect of PMB on LPS. We found that neither 0.0001% OVA (containing 1 EU/mL LPS) nor 0.001% OVA (containing 10 EU/mL LPS) increased CD86 expression to a level above the cut-off value of the h-CLAT. This was due to our diluting OVA to a concentration from 1000- to 10,000-fold lower than that used in our previous study (0.01%, 0.1%, and 1%) in order to match the LPS concentration (1 or 10 EU/mL) (Tsukumo et al., 2018). CD54 might be more sensitive to LPS than CD86 based on its expression being increased to a level above the h-CLAT cut-off by 0.001% OVA. Furthermore, pre-incubation with CCM at 37°C for 24 hr decreased CD54 expression to a level that did not necessitate inhibition by PMB. Therefore, these results suggested that pre-incubation with CCM might inhibit LPS-induced CD54 expression to a degree similar to that of PMB. We investigated the effect of solvent on LPS- or OVA-induced activities based on results showing that pre-incubation with CCM at 37°C for 24 hr decreased CD86 and CD54 expression. We found that pre-incubation in CCM inhibited LPS-induced CD86 and CD54 expression, whereas pre-incubation in saline did not. Moreover, we observed that CD54 expression induced by 0.001% OVA dissolved in saline decreased after pre-incubation for 24 hr, whereas CCM pre-incubation had a greater effect on CD54 expression than saline. These data suggested that LPS or protein pre-incubated with CCM had a greater effect on CD86 and CD54 expression than pre-incubation at 37°C for 24 hr. Pre-incubation in CCM might inhibit LPS-induced CD86 and CD54 expression to a degree similar to that of PMB. Therefore, we investigated the effect of LPS inhibition by pre-incubation with CCM on the evaluation of protein allergenicity. We used LPS concentrations in each protein solution of 10170 EU/mL (1% OVA), 28.2 EU/mL (1% OVM), and 2.34 EU/mL (1% LYZ), and compared the threshold of LPS-induced CD86 expression, which can be inhibited by CCM to levels below the h-CLAT cut-off (10 EU/mL). Our results showed that LPS concentrations in OVA were 1000-fold higher than the h-CLAT cut-off value, whereas levels in OVM were 3-fold higher, and those in LYZ were below the threshold. These results indicated that LYZ could be evaluated positively in the absence of LPS-specific effects, because CD86 expression was beyond the cut-off following pre-incubation at 37°C for 24 hr. Additionally, pre-incubation of OVA decreased CD54 expression, albeit with non-significant differences in the results due to the high concentration of LPS in OVA (10170 EU/mg) and the variability in CD54 expression. Combination of h-CLAT and pre-incubation for assessing the allergenic potency of proteins in the presence of LPS contamination. 2. In the event of negative results, determine whether the protein in the sample is not considered a cause of skin sensitization. 3. In the event of a positive result, especially based on elevated CD54 expression, consider the possible effect of LPS contamination and pre-incubate the sample with PMB and CCM. 4. If pre-incubation results in decreased CD86 or CD54 expression, this suggests that the protein sample is unsuitable for evaluation using the h-CLAT, and that LPS will need to be removed from the protein sample prior to re-evaluation. 5. If pre-incubation does not result in decreased CD86 or CD54 expression, the protein in the sample is considered a cause of skin sensitization. However, we should note that this protocol cannot be applied if we evaluate the test protein containing LPS with high concentration. We believe that these findings will improve the in vitro assessment of skin sensitization potential of proteins. Aiba, S. (1998): Maturation of dendritic cells induced by cytokines and haptens. Tohoku J. Exp. Med., 184, 159-172. Ainscough, J.S., Frank Gerberick, G., Dearman, R.J. and Kimber, I. (2013): Danger, intracellular signaling, and the orchestration of dendritic cell function in skin sensitization. J. Immunotoxicol., 10, 223-234. 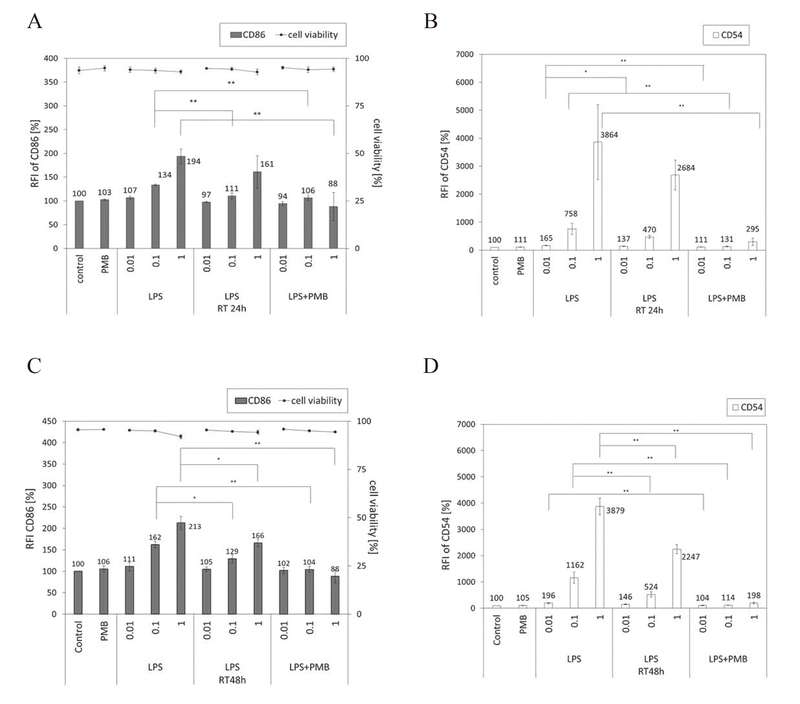 Ashikaga, T., Hoya, M., Itagaki, H., Katsumura, Y. and Aiba, S. (2002): Evaluation of CD86 expression and MHC class II molecule internalization in THP-1 human monocyte cells as predictive endpoints for contact sensitizers. Toxicol. In Vitro, 16, 711-716. Berin, M.C. and Shreffler, W.G. (2008): T(H)2 adjuvants: implications for food allergy. J. Allergy Clin. Immunol., 121, 1311-1320. Borges, P.V., Moret, K.H., Raghavendra, N.M., Maramaldo Costa, T.E., Monteiro, A.P., Carneiro, A.B., Pacheco, P., Temerozo, J.R., Bou-Habib, D.C., das Graças Henriques, M. and Penido, C. (2017): Protective effect of gedunin on TLR-mediated inflammation by modulation of inflammasome activation and cytokine production: evidence of a multitarget compound. Pharmacol. Res., 115, 65-77. Cardoso, L.S., Araujo, M.I., Góes, A.M., Pacífico, L.G., Oliveira, R.R. and Oliveira, S.C. (2007): Polymyxin B as inhibitor of LPS contamination of Schistosoma mansoni recombinant proteins in human cytokine analysis. Microb. Cell Fact., 6, 1. Cassel, S.L., Joly, S. and Sutterwala, F.S. (2009): The NLRP3 inflammasome: a sensor of immune danger signals. Semin. Immunol., 21, 194-198. Caux, C., Vanbervliet, B., Massacrier, C., Azuma, M., Okumura, K., Lanier, L.L. and Banchereau, J. (1994): B70/B7-2 is identical to CD86 and is the major functional ligand for CD28 expressed on human dendritic cells. J. Exp. Med., 180, 1841-1847. Chanput, W., Mes, J., Vreeburg, R.A., Savelkoul, H.F. and Wichers, H.J. (2010): Transcription profiles of LPS-stimulated THP-1 monocytes and macrophages: a tool to study inflammation modulating effects of food-derived compounds. Food Funct., 1, 254-261. Chanput, W., Mes, J.J. and Wichers, H.J. (2014): THP-1 cell line: an in vitro cell model for immune modulation approach. Int. Immunopharmacol., 23, 37-45. Chen, C.-C., Chen, J.-J. and Chou, C.-Y. (2000): Protein kinase Cα but not p44/42 mitogen-activated protein kinase, p38, or c-Jun NH(2)-terminal kinase is required for intercellular adhesion molecule-1 expression mediated by interleukin-1β: involvement of sequential activation of tyrosine kinase, nuclear factor-κB-inducing kinase, and IκB kinase 2. Mol. Pharmacol., 58, 1479-1489. Cooperstock, M. and Riegle, L. (1981): Polymyxin B inactivation of lipopolysaccharide in vaccines of Gram-negative bacteria. Infect. Immun., 33, 315-318. Daubeuf, B., Mathison, J., Spiller, S., Hugues, S., Herren, S., Ferlin, W., Kosco-Vilbois, M., Wagner, H., Kirschning, C.J., Ulevitch, R. and Elson, G. (2007): TLR4/MD-2 monoclonal antibody therapy affords protection in experimental models of septic shock. J. Immunol., 179, 6107-6114. Donnelly-Roberts, D.L., Namovic, M.T., Faltynek, C.R. and Jarvis, M.F. (2004): Mitogen-activated protein kinase and caspase signaling pathways are required for P2X7 receptor (P2X7R)-induced pore formation in human THP-1 cells. J. Pharmacol. Exp. Ther., 308, 1053-1061. Ghuman, J., Zunszain, P.A., Petitpas, I., Bhattacharya, A.A., Otagiri, M. and Curry, S. (2005): Structural basis of the drug-binding specificity of human serum albumin. J. Mol. Biol., 353, 38-52. Guha, M. and Mackman, N. (2001): LPS induction of gene expression in human monocytes. Cell. Signal., 13, 85-94. Honda, T., Egawa, G., Grabbe, S. and Kabashima, K. (2013): Update of immune events in the murine contact hypersensitivity model: toward the understanding of allergic contact dermatitis. J. Invest. Dermatol., 133, 303-315. Kanda, Y. (2013): Investigation of the freely available easy-to-use software ‘EZR’ for medical statistics. Bone Marrow Transplant., 48, 452-458. Komatsu, T., Aida, Y., Fukuda, T., Sanui, T., Hiratsuka, S., Pabst, M.J. and Nishimura, F. (2016): Disaggregation of lipopolysaccharide by albumin, hemoglobin or high-density lipoprotein, forming complexes that prime neutrophils for enhanced release of superoxide. Pathog. Dis., 74, ftw003. Kragh-Hansen, U. (1990): Structure and ligand binding properties of human serum albumin. Dan. Med. Bull., 37, 57-84. Liao, P.-C., Chao, L.K., Chou, J.-C., Dong, W.C., Lin, C.N., Lin, C.Y., Chen, A., Ka, S.M., Ho, C.L. and Hua, K.F. (2013): Lipopolysaccharide/adenosine triphosphate-mediated signal transduction in the regulation of NLRP3 protein expression and caspase-1-mediated interleukin-1β secretion. Inflamm. Res., 62, 89-96. Lin, F.S., Lin, C.C., Chien, C.S., Luo, S.F. and Yang, C.M. (2005): Involvement of p42/p44 MAPK, JNK, and NF-κB in IL-1β-induced ICAM-1 expression in human pulmonary epithelial cells. J. Cell. Physiol., 202, 464-473. Liu, S., Tobias, R., McClure, S., Styba, G., Shi, Q. and Jackowski, G. (1997): Removal of endotoxin from recombinant protein preparations. Clin. Biochem., 30, 455-463. Magalhães, P.O., Lopes, A.M., Mazzola, P.G., Rangel-Yagui, C., Penna, T.C. and Pessoa, A. Jr. (2007): Methods of endotoxin removal from biological preparations: a review. J. Pharm. Pharm. Sci., 10, 388-404. McLellan, A.D., Starling, G.C., Williams, L.A., Hock, B.D. and Hart, D.N. (1995): Activation of human peripheral blood dendritic cells induces the CD86 co-stimulatory molecule. Eur. J. Immunol., 25, 2064-2068. Mitachi, T., Kouzui, M., Maruyama, R., Yamashita, K., Ogata, S., Kojima, H. and Itagaki, H. (2019): Some non-sensitizers upregulate CD54 expression by activation of the NLRP3 inflammasome in THP-1 cells. J. Toxicol. Sci., 44, 213-224. Morrison, D.C. and Jacobs, D.M. (1976): Binding of polymyxin B to the lipid A portion of bacterial lipopolysaccharides. Immunochemistry, 13, 813-818. Park, C.W., Kim, J.H., Lee, J.H., Kim, Y.S., Ahn, H.J., Shin, Y.S., Kim, S.Y., Choi, E.J., Chang, Y.S. and Bang, B.K. (2000): High glucose-induced intercellular adhesion molecule-1 (ICAM-1) expression through an osmotic effect in rat mesangial cells is PKC-NF-κB-dependent. Diabetologia, 43, 1544-1553. Petsch, D. and Anspach, F.B. (2000): Endotoxin removal from protein solutions. J. Biotechnol., 76, 97-119. Raetz, C.R. and Whitfield, C. (2002): Lipopolysaccharide endotoxins. Annu. Rev. Biochem., 71, 635-700. Reichelt, P., Schwarz, C. and Donzeau, M. (2006): Single step protocol to purify recombinant proteins with low endotoxin contents. Protein Expr. Purif., 46, 483-488. Roebuck, K.A. and Finnegan, A. (1999): Regulation of intercellular adhesion molecule-1 (CD54) gene expression. J. Leukoc. Biol., 66, 876-888. Rylander, R. (2002): Endotoxin in the environment--exposure and effects. J. Endotoxin Res., 8, 241-252. Sakaguchi, H., Ashikaga, T., Miyazawa, M., Kosaka, N., Ito, Y., Yoneyama, K., Sono, S., Itagaki, H., Toyoda, H. and Suzuki, H. (2009): The relationship between CD86/CD54 expression and THP-1 cell viability in an in vitro skin sensitization test--human cell line activation test (h-CLAT). Cell Biol. Toxicol., 25, 109-126. Sakaguchi, H., Ashikaga, T., Miyazawa, M., Yoshida, Y., Ito, Y., Yoneyama, K., Hirota, M., Itagaki, H., Toyoda, H. and Suzuki, H. (2006): Development of an in vitro skin sensitization test using human cell lines; human Cell Line Activation Test (h-CLAT). II. An inter-laboratory study of the h-CLAT. Toxicol. In Vitro, 20, 774-784. Schenck, J.R., Hargie, M.P., Brown, M.S., Ebert, D.S., Yoo, A.L. and McIntire, F.C. (1969): The enhancement of antibody formation by Escherichia coli lipopolysaccharide and detoxified derivatives. J. Immunol., 102, 1411-1422. Schumann, R.R., Belka, C., Reuter, D., Lamping, N., Kirschning, C.J., Weber, J.R. and Pfeil, D. (1998): Lipopolysaccharide activates caspase-1 (interleukin-1-converting enzyme) in cultured monocytic and endothelial cells. Blood, 91, 577-584. Sharif, O., Bolshakov, V.N., Raines, S., Newham, P. and Perkins, N.D. (2007): Transcriptional profiling of the LPS induced NF-κB response in macrophages. BMC Immunol., 8, 1. Shimazu, R., Akashi, S., Ogata, H., Nagai, Y., Fukudome, K., Miyake, K. and Kimoto, M. (1999): MD-2, a molecule that confers lipopolysaccharide responsiveness on Toll-like receptor 4. J. Exp. Med., 189, 1777-1782. Song, M. and Phelps, D.S. (2000): Comparison of SP-A and LPS effects on the THP-1 monocytic cell line. Am. J. Physiol. Lung Cell. Mol. Physiol., 279, L110-L117. Takami, S., Yamashita, S., Kihara, S., Kameda-Takemura, K. and Matsuzawa, Y. (1998): High concentration of glucose induces the expression of intercellular adhesion molecule-1 in human umbilical vein endothelial cells. Atherosclerosis, 138, 35-41. Talcott, J.A., Ness, D.B. and Grumet, F.C. (1975): Adjuvant effect of LPS on in vivo antibody response: genetic defect in C3H/HeJ mice. Immunogenetics, 2, 507-515. Talmadge, K.W. and Siebert, C.J. (1989): Efficient endotoxin removal with a new sanitizable affinity column: Affi-Prep Polymyxin. J. Chromatogr. A, 476, 175-185. Teodorowicz, M., Perdijk, O., Verhoek, I., Govers, C., Savelkoul, H.F., Tang, Y., Wichers, H. and Broersen, K. (2017): Optimized Triton X-114 assisted lipopolysaccharide (LPS) removal method reveals the immunomodulatory effect of food proteins. PLoS One, 12, e0173778. Tsuchiya, M. (1990): Use of limulus test and its application. J. Antibact. Antifung. Agents, 18, 287-294. Tsukumo, H., Matsunari, N., Yamashita, K., Kojima, H. and Itagaki, H. (2018): Lipopolysaccharide interferes with the use of the human Cell Line Activation Test to determine the allergic potential of proteins. J. Pharmacol. Toxicol. Methods, 92, 34-42. Wang, X., Feuerstein, G.Z., Gu, J.-L., Lysko, P.G. and Yue, T.-L. (1995): Interleukin-1β induces expression of adhesion molecules in human vascular smooth muscle cells and enhances adhesion of leukocytes to smooth muscle cells. Atherosclerosis, 115, 89-98. Watanabe, H., Gaide, O., Pétrilli, V., Martinon, F., Contassot, E., Roques, S., Kummer, J.A., Tschopp, J. and French, L.E. (2007): Activation of the IL-1β-processing inflammasome is involved in contact hypersensitivity. J. Invest. Dermatol., 127, 1956-1963. Yang, C.M., Luo, S.F., Hsieh, H.L., Chi, P.L., Lin, C.C., Wu, C.C. and Hsiao, L.D. 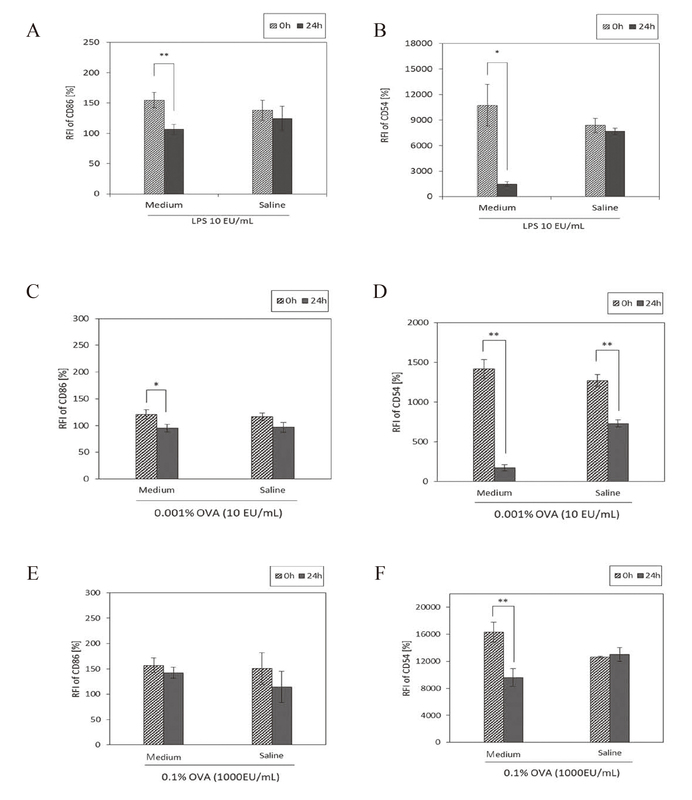 (2010): Interleukin-1β induces ICAM-1 expression enhancing leukocyte adhesion in human rheumatoid arthritis synovial fibroblasts: involvement of ERK, JNK, AP-1, and NF-κB. J. Cell. Physiol., 224, 516-526. Yoshimura, A., Hara, Y., Kaneko, T. and Kato, I. (1997): Secretion of IL-1β, TNF-α, IL-8 and IL-1ra by human polymorphonuclear leukocytes in response to lipopolysaccharides from periodontopathic bacteria. J. Periodontal Res., 32, 279-286.